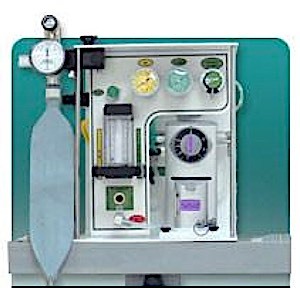 The Anesthesia machine Model 3 device has no ventilator, meaning that each patient must be spontaneously breathing or be bagged by the provider. This machine was designed for the user whose requirement is for short procedures in which a ventilator is not necessary, as well as itinerant providers, mission groups and customers whose capital equipment budgets require a basic anesthetic gas delivery device, as it is among the least expensive FDA cleared anesthesia delivery devices available. Model 3 may be configured to be MRI certified, and due to its small footprint and very light weight it may be very conveniently used in a variety of special procedure rooms within a hospital environment, as well as surgical centers. Pneumatically powered by either air or oxygen, this device is completely portable and as with all Oceanic anesthesia models, the single agent anesthetic vaporizer in your choice of available agent is included within the price, not added as a necessary option. The Model 3 deserves your serious consideration if your requirements are for a simple, inexpensive device. Weight: Free Standing 29 lbs. fully equipped Shipping Weight 40 lbs. Flowmeter Fresh Gas Flow Calibrated and scaled 0-15 lpm > 30 lpm. Oxygen Flush Valve Recessed, self-closing, push-button, color coded, and labeled, provides 45-55 lpm constant flow, while push-button is depressed. Important Note: This product is intended for use inside of the MRI environment (e.g., in the MR system room, close to the scanner0. However, it should not be utilized directly inside of the MR system (e.g., inside of the bore of the scanner), itself.